For those of you who opened this link for “The Columbian,” you are reading the first online edition of Columbia College’s student newspaper. That’s right: This issue marks the first of the last year of printed editions of “The Columbian” forever. With ever-changing technology, declining readership of printed newspapers and more and more people getting their news online, “The Columbian” has decided to hop on the bandwagon and follow the trend of converting our printed paper to an online version. Shocking, I know, but not to worry. This year is a transition phase, so you will still be able to access our printed newspapers from the stands. But next year they will be nonexistent. The online “Columbian” can be sent directly to your e-mail inbox or accessed on Cougar Link. For an e-mailed subscription, please contact our staff at columbian@ccis.edu. On that note, our staff will honor the history of the college’s paper throughout the school year in its last printed editions. 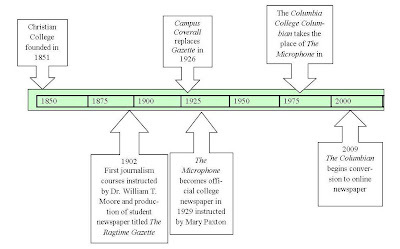 From my research, I have developed a timeline (right) of my discoveries about the history of Columbia College’s student newspaper and will be updating the timeline periodically, giving a full assessment of my finding at the end of the semester. We also will include archived photos of previous staff members to provide you with an image of the changing times of the student newspaper. We are grateful to Beth Hastings, Web designer in the Public Relations department, for her hard work and support in developing the template for "The Columbian" online. 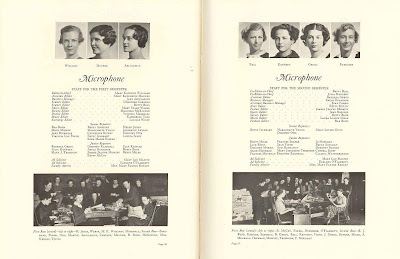 The Columbia College 1936 “Microphone” staff. From the Columbia College yearbook.